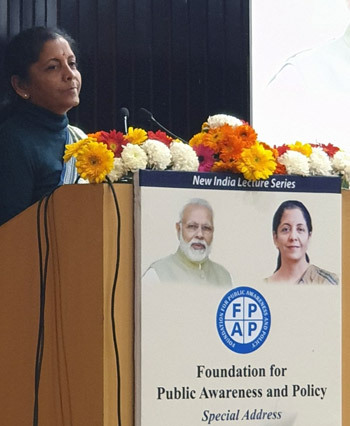 Union Minister of Defence, Nirmala Sitharaman Special Address on 'India's Strategic Interest in Context of the Rafale Deal'. Defence Minister Nirmala Sitharaman has raised the question whether the unbridled political Opposition to the Rafale jet deal is playing into the hands of corporate interests intent on scuttling the deal and hurting national interest. She raised this "suspicion" at a lecture on January 19 in New Delhi. The lecture was titled 'India's strategic interest in context of the Rafale deal'. "The (Rafale) debate is somehow moving towards stopping this purchase," she said, hinting that this was also the objective of some corporate interests. "I hope they (the political Opposition) are not becoming party to corporate rivalry," the Defence Minister said, terming such an outcome a "disservice to national interest". While the Minister did not identify the corporate interests she alleged were trying to scuttle the Rafale deal, she has previously mentioned the repeated bids by Eurofighter to be considered again. Rafale was down selected by the IAF from among six leading fighter aircraft in the previous, abortive MMRCA programme. The only other aircraft which had made it to the final shortlist was the Eurofighter Typhoon, which, the Minister earlier disclosed in Parliament, made an unsolicited offer of 20 per cent discount after the French Rafale was declared the winner of the MMRCA competition. This offer was rejected by the previous UPA Government as it was held violative of procedure. This offer was reiterated in 2014 after the NDA Government took office. It was rejected again. Slamming the previous Congress-led UPA Government for a "Decade of No Decision" resulting in failure to purchase even a single fighter in the MMRCA programme, she asked whether the intention of the Congress now is to "sabotage the Rafale procurement". "This will be a cruel last hit," a feisty Sitharaman said, lambasting the Congress-led opposition to the government-to-government deal with France for procurement of 36 Rafale fighter jets. In a lecture laced with innuendo, she suggested that the opposition to the Rafale suited those whose interests had been thwarted by the Modi Government. "This Government has stopped middlemen coming into the corridors of South Block," she thundered. 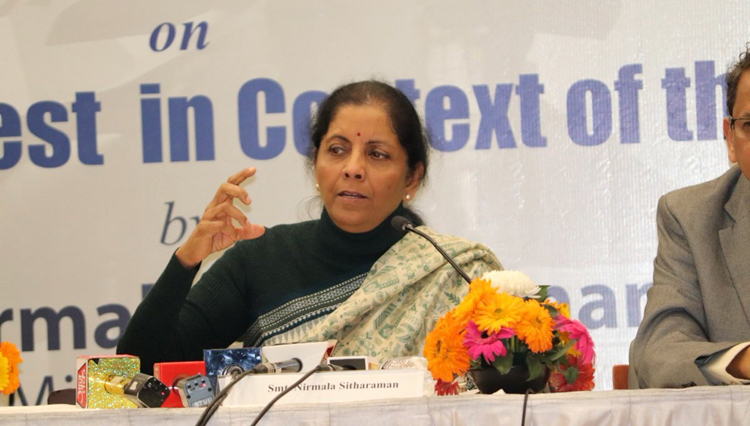 Slamming the previous Congress-led UPA Government for a "Decade of No Decision" resulting in failure to purchase even a single fighter in the MMRCA programme, she asked whether the intention of the Congress now is to "sabotage the Rafale procurement"
Tearing into the 10-year record of the previous Government, the Defence Minister said indecision on military procurements from 2004 to 2014 was the "biggest disservice" to national security at a time when the neighborhood was arming up. The suspicion now is that the objectives of the same political forces, now in the Opposition, are now aligned with corporate interests desperate to kill the Rafale deal. Responding to a question by SP's editor-in-chief Jayant Baranwal on whether defence procurements should be kept out of political contest, she said there's a fine line between transparency and the requirements of national security which necessitate restraint in politicising such issues. She said while her Government was ready to answer questions on the Rafale deal, the Opposition's approach was not reasonable, which she alleged was attempting to mislead public opinion. "If your desire is to make sure that no wrongdoing happened, please ask questions. But if you're constantly harping on it from the point of view of misinformed debate...I have raised the question: I hope these people are not becoming party to corporate rivalry," she responded. In his opening remarks before the Defence Minister's lecture, the recently retired Vice-Chief of Air Staff, Air Marshal Shirish Deo warned that stopping the Rafale deal would be "catastrophic for India". "It will leave us weak and vulnerable at a time when neighbours are arming to the teeth. if we don't get this aircraft quickly, we're seriously compromising national security," he said. "This is not Agusta Westland where you could stop the deal. Those choppers were meant only to ferry VVIPs. This is a weapon. If you don't want a repeat of 1962, we need this aircraft," he said. India needs to quickly scale up its military capability because there is a possibility that non-state actors could brings us to the brink (of war), Air Marshal Deo said. "The Rafale and the S-400 will change the way we fight," the former Vice-Chief said. While he is apolitical as a military officer, he was "deeply concerned as a citizen" over the political debate on the Rafale deal. Air Marshal Deo expressed his disappointment that the Opposition was insisting on discussing the weapon package and the India-specific enhancements on the Rafale. "Discussing India-specific enhancements is treason," he said. Air Marshal Deo also regretted the political attack on the Chief of Air Staff, Air Chief Marshal BS Dhanoa for speaking the facts about the Rafale acquisition.